Introducing my new collaboration with Cotswold Collectibles: RACCS: ready attachable configurable component system. 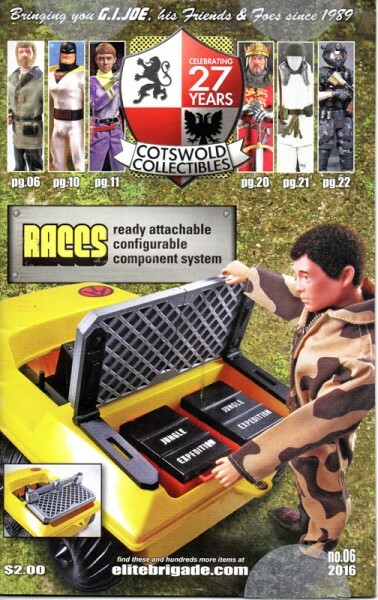 Cover of the latest catalog shows the base RACCS set, with hinges attached, covering two vintage Adventure Team crates fitted into a vintage Adventure Team Vehicle. Sidebar shows the RACCS hinged down with the first module, the Hand Copter Carrier, slotted in near the back. 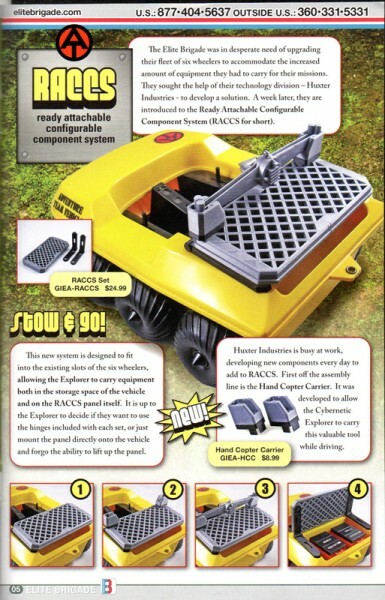 The RACCS base set includes the RACCS mounting platform which slots directly into an ATV or Trouble Shooter, or can have hinges attached which then slot in. With the hinges the platform doubles as an openable lid for the cargo bay. The hinges are slotted to the platform first. They snap in on an angle so that when the hinges are attached to the ATV, the platform doesn’t slip and slide. Lots of cool pics of it in various configurations are available here. The system allows modules to be slotted into the diagonal grid in any way that works for your particular adventure. Just as many collectors own a vintage ATV, many also own a vintage Mike Power (Atomic Man) and his hand copter. This module allows convenient carrying of that blade when collapsed. As the text indicates, RACCS is a configurable system, and the first module is available for pre-order now. It also indicates we are working on more modules for the future. We are indeed. What those are I can’t say, but they are exciting and quite cool, and I know you’ll love them.